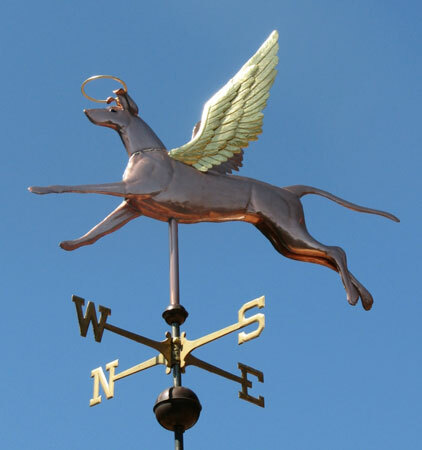 Our Angel Dog Weathervane was originally commissioned by a customer who kept dogs all her life and wanted something to remember all of them by. Because she had loved many different breeds of dogs over the years she did not want a specific dog breed for her weathervane, but one that was representative of dogs in general. She also wanted the dog to be portrayed as happy and bounding with youthful energy. Just as the brightest star in the night sky is Sirius, The Dog Star, in Canis Majoris, her dogs were a bright spot in her life. This weathervane can also be made to represent a particular breed of dog (see all the other dog breeds we have done to date for ideas on how this might be done), and we can also add a collar with your dog’s name on it. There is a tradition that involves ‘lucky’ pennies on and in weathervanes. In the case of the Angel Dog shown here, we included pennies for the births and deaths of all her beloved companions. Handcrafted in copper, this Angel Dog Weathervane has glass eyes and optional gold leafing on the wings and halo. From your photographs we can customize your weather vane to depict your favorite dog. Glass eye color can be selected to accommodate a variety of dog eye colors. All of our dog Weathervanes can be made with an optional collar. We can actually inscribe your dog’s name on the collar in either ¼” or ⅛” tall stamped letters (up to 30 letters at no charge) or we can add a tag in the shape of a dog bone, a heart or a circle. Using a combination of these options, we can incorporate up to three dog’s names on your weather vane! What we do is put one dog’s name on one side of the collar, another dog’s name on the opposite side of the collar and a third name on the dog tag. The collar and/or tag can be optionally gold leafed as well. If you have ideas for a commemorative weathervane, please give us a call at (800) 762-8736 or email us at info@westcoastweathervanes.com. We would be happy to discuss your project with you.